With the global and regional markets for thermoplastic elastomers (TPEs) expected to grow in the future, KRAIBURG TPE’s regional headquarters in Malaysia, where it also has a facility, is expanding its operations, ready to face the growing market demand. PRA spoke to Roland Ritter, Director, KRAIBURG TPE Asia Pacific, and Hew Hong Yong, Managing Director of KRAIBURG TPE Technology (M) Sdn Bhd, to provide an update on the company’s operation in Asia. We first commenced operations in Nilai in 1996, with just three staff. In 2002, as the business expanded, we moved to Puchong, Selangor. Then in 2008, we established our production facility in Seri Kembangan. Our initial production capacity was 2,500 tonnes/year and by 2017 it will be 10,200 tonnes/year, truly a remarkable achievement indeed! We will be celebrating our 20th anniversary this year in Malaysia, with our Asia Pacific staff force having grown to 120 personnel. Indeed, we are confident and ready to meet the huge demand for our products within the Asia Pacific region. 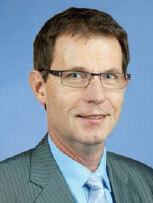 KRAIBURG TPE has expanded its offices regionally. Which countries does this reach extend to? KRAIBURG TPE is continuously expanding its reach, as a commitment to lead as the premium TPE manufacturer and global competence leader. In 2004, we successfully entered the Chinese market through a joint venture with Milton Holdings; in 2007, we opened a local sales office in India. Today, our Asia Pacific sales network includes sales offices in Malaysia, China (Shanghai, Wuhan, Shenyang, Guangzhou), Hong Kong, Taiwan, India (Bangalore, Pune, Delhi, Chennai), Thailand, Vietnam, South Korea. We also have sales partners in Japan, South Korea, Australia, New Zealand, Sri Lanka, Indonesia and Philippines. 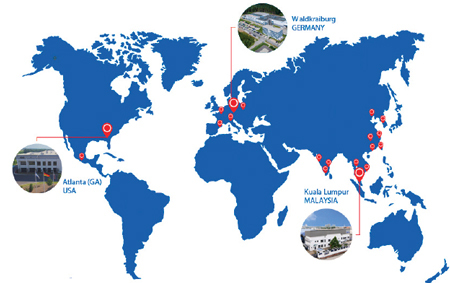 Since KRAIBURG TPE’s headquarters is in Germany, explain the technology transfer process to Malaysia? KRAIBURG TPE’s production capabilities and offerings in Malaysia have broadened extensively over the years, as a result of having cooperated closely with the corporate office in Germany. Both technical and product knowledge have been successfully transferred through a communication structure of global networking and training of personnel. In fact, today, more than 90% of TPE compounds produced in Germany are able to be reproduced at the Malaysia plant, utilising the existing facilities and resources, except for the medical and drinking water compounds. Since the Malaysian production started up in 2008, the manufacturing practices applied in the facility have been highly appraised by the numerous global OEMs we work with. How was the company’s performance in 2015 globally speaking and also in Asia and China? Globally speaking, our performance was very encouraging in 2015, especially within China and Asia on the macro level. In fact, we have doubled our revenue in Asia, over the last five years. We are confident of achieving even better results in 2016 and beyond, given that our global sales revenue increased by 13% (2015 versus 2014). Plus, we achieved a 20% increase in turnover in the first quarter of 2016, compared to the same period in 2015. Has the slowdown in China’s economy affected the business? What future plans are in store for the Chinese market? KRAIBURG TPE’s business in China has been positively encouraging. In fact, our sales have increased significantly, in lieu of the slowdown. Perhaps we can attribute this to the successful implementation of our R&D and sales and services strategy that are aligned to meet market needs. We are expanding our warehouse in China to strengthen our logistic supply in the Chinese market in order to increase logistical efficiency whilst providing better services, and to meet the increasing demands for our products. We will continue to expand our logistical infrastructure in the near future by establishing new warehouses in strategic locations across China to further improve our fulfillment efficiency and support long-term growth. KRAIBURG TPE has recently successfully registered the Chinese branding name- 凯柏胶宝®. Explain the rationale behind this. We have internationalised our globally renowned products with a localised touch to strengthen our business in China with Chinese brand identities relatable to Chinese values and culture. For instance, we have painstakingly researched and developed 凯柏胶宝® to represent KRAIBURG TPE in Mandarin. The last character “băo” (宝) literally means “treasure”, implying that KRAIBURG TPE offers a wide scope of “treasures”, from customised compounds, superior quality, excellent service and more. The automotive and in general transportation markets represent more than half global TPE consumption. Is KRAIBURG TPE investing in new resources for these sectors? Yes, KRAIBURG TPE will be investing in R&D, new product development and lab test equipment expansion for the above mentioned sectors. To enhance our professional service to serve our customers better, we will be allocating product specialists to strengthen the customer experience in every industry. Our automotive TPE compounds already comply with weathering, odour, fogging and other requirements. These include the GM standard, Kalahari test, Florida test and others. Which other application sectors are doing well for TPEs? Apart from the automotive market, the consumer wearable and consumer electronics industry is our next big focus. This is because consumer wearable, consumer electronic and electrical devices are increasing the demand of using TPE materials. These include soft straps, wrist band, ear pieces, eyeglass frames for smartphone devices, power tools and so forth. 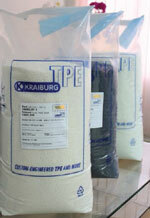 KRAIBURG TPE’S COPEC® and For Tec E® are the ideal material solutions. The main characteristics of the materials include comfort, easy to be coloured, silky soft, irritation-free and good adhesion. On top of that, drinking water applications will also become the next highlight as well. Our drinking water TPE conforms to all important international certifications to ensure compliance with high safety and hygiene standards. They are therefore also ideal for use for hoses in sanitary systems or beverage dispensers. In what areas is KRAIBURG TPE strengthening to enhance the business? We plan to localise our TPE manufacturing facilities and introduce a unique virtual factory concept to meet the increasing demand of our products in China. 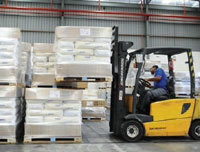 Our aim is to enhance cost efficiency and speedy response time to benefit our customers. 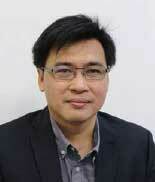 To enhance our business, we plan also to expand our sales force and technical service team. For the benefit of automotive makers, we will provide solutions to them on specific applications by listing our TPE compounds that have been globallyapproved in the Approved Source List (ASL) for their car models that are produced in different regions. Furthermore, we recently launched a colour compounding service to offer comprehensive colour solutions to our customers. Our TPEs can be colourcompounded upon request, regardless of application requirements. Our colours are consistent with worldwide colour qualities, allowing our customers to brighten up their products with our colourcompounded TPEs. In view of sustainable development, what has KRAIBURG TPE done to make the materials “greener”? We are already looking into other eco-friendly, sustainable alternatives to replace the use of white oils currently used in the production of our compounds. 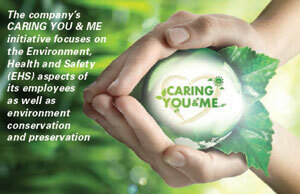 KRAIBURG TPE has a “CARING YOU & ME” Energy Awareness Campaign launched in April 2014. Explain what this is. The campaign focuses on the Environment, Health and Safety (EHS) aspects of employees. We are ISO50001-certified as of March 2016. With this, we are set to improve energy performance, minimise operational costs, enhance brand image and reputation through quality products, and better quality of life for employees and the community. This is evident that we are strengthening our responsibility towards improving energy efficiency, in addition to our existing ISO 9001:2008 Quality Management and ISO 14001:2004 Environmental Management commitments. This also further highlights our continuous organisation-wide commitment towards energy efficiency and environmental management as we strive to capture, sustain, and continuously expand energy savings while supporting sustainability and carbon reduction goals.